Veneering can be use to make an inexpensive look of high quality, of make a piece of fine furniture pop. Veneering can be a specialty onto itself, and lead to other areas of woodworking. If you've been wanting to tackle a wood veneering project, but haven't been sure how to get started, you've come to the right place. At Rockler Woodworking and Hardware, we want to help you get started with your first veneering project, and we want it to be a success. 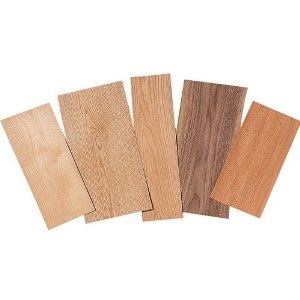 So we put together this article where we'll give you a glimpse of the history of wood veneering, describe a few of veneers most outstanding benefits, and describe the common types of veneer and methods for applying veneer to a substrate. Using wood as a veneer has been done for thousands of years, and with good reason. It is the best way to get the most coverage from a single piece of lumber. Many designs, possible with veneer would simply self destruct if attempted with solid wood. It is certainly not an indication of inferior quality. Some of the finest furniture in the world would not have been possible without the use of veneers. The opportunities to create many patterns and matches just wouldn't be possible using solid lumber. If someone tried, the result would self destruct. When you start to investigate the available veneers on the market, it becomes very difficult for me to understand any resistance to it, that some people have. Maybe it's fear of the unknown. Maybe you've heard, read, or thought that veneering is a difficult process. This is far from true and its doesn't take much to learn the basics. The methods are simple, the tools and supplies are readily available, and the learning curve is short and straight-forward. What do you think of when you hear the word "veneer?" If the term calls to mind furniture masterpieces with complicated marquetry designs or criss-crossing patterns of inlay, then you may think of wood veneering as an exalted technique reserved for only the most skilled woodworkers. Veneering, one of mankind's most ancient crafts, is quite simply the covering of more common woods with a thin laminate or layer of fine, decorative wood.